Our Top Ten Sampler includes ten bars of our Top Ten Best Selling scents, including a few each of our regular recipe, goat milk and hand repair formulas to introduce you (or the recipient of your gift) to our soaps. One bar each of Fresh Mountain Air, Appalachian Sunrise, Kitchen Cook Scrub Bar, Mountain Morning Wake Up Call, Oatmeal Milk & Honey Goat Milk, Lavender Cream Goat Milk, Apple Berries and Cream Goat Milk, Stud Bubbles, and Mountain Herb and Jasmine Crafter's Hand Repair. Minimum weight 15 ounces, or equivalent to five bars of our soap. 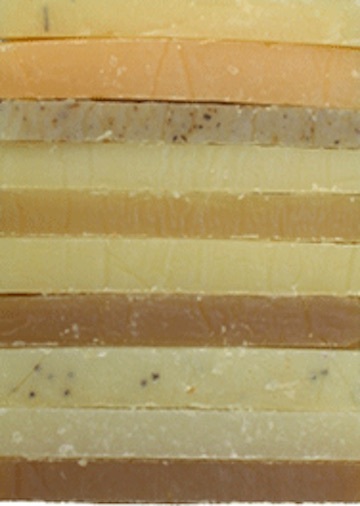 Soaps in this Sampler will include Olive, Coconut, Palm and Castor Oils, Shea Butter, Cocoa Butter, Sodium Hydroxide (Lye), Mountain Spring Water, Goat Milk, herbs and botanicals, essential oils and fragrances.